From the iconic Super Mario and Tetris themes rooted in every generation X/Y-ers mind, to the stunning orchestral pieces you find accompanying the Assassin's Creed franchise - game music is now an industry all of its own. It's also an area that we suspect most modern music-makers - from the bedroom producers to orchestral composers - have considered trying to break into at some point. But how exactly do you go about that? How do the demands of the work differ? And what background is required? 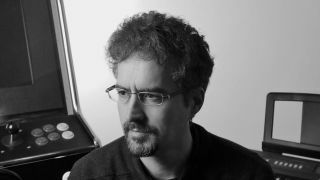 We asked BAFTA-winning composer and co-founder of Game Music Connect James Hannigan - a man who's worked on major franchises from Command And Conquer to Dead Space - about his own experiences in the industry. What was your musical background prior to getting involved with video game music? "Getting things down on tape interested me a lot as a kid and my primary interest was in making noises, creating eerie soundscapes"
"I'd always enjoyed making music as a child and I quickly got into multi-track recording as a teenager, then a little later into software sequencers such as Music X on the Amiga, which I used until Cubase hit the scene. My main instrument was the piano and I was lucky enough to have regular lessons as a kid. Getting things down on tape interested me a lot at that stage and my primary interest was in making noises, creating eerie soundscapes and what you might call ambient music now." How did you first come to compose music for games? "In the early 90s, around the age of 22 or 23 and while looking to break into TV, film or games, I supplemented my income by writing library music for companies like Atmosphere and Sony, but no sooner had I sent out my demo tape than I was offered a job at Electronic Arts as in-house composer. Back then in the UK I found the office-based, computer industry vibe of games development and 'industrial parks' to be unsuitable for me, and I left after a couple of years to go freelance." What do you feel was the key to your early projects' success? "When at EA and shortly afterwards I worked on games such as Privateer: The Darkening, various EA Sports titles, a couple of entries in the Theme Park series and various other titles. The Darkening, which sort of related to the Wing Commander universe, was very interesting as it belonged to an era of games with live action in them. There was basically an entire movie in it, starring Christopher Walken, John Hurt and Clive Owen, interspersed with CG cutscenes and bouts of spaceflight and gameplay.It possibly wasn't the most cohesive experience looking back on it (games have really come on now in terms of how well they integrate linear sequences, for example) but it was still engaging and a lot of fun. "Back then, it felt like anything was possible in audio and there weren't any rules. I don't know if that was because the 'higher ups' were indifferent about it or if it was simply because everyone was more open to being creative, but I simply remember being able to try all kinds of crazy stuff out in games, even in fairly mainstream ones." How does composing music for games differ to composing for film, or television? "I strongly believe composing for games is about understanding the medium and not just being able to write music"
"Within the conventions of the film or TV viewing experience the audience is entirely passive, and music most often exists for narrative support. Crucially, the stems of the soundtrack are organised to support the nature of that experience as well. "That's pretty obvious, you might say, but consider then what happens when you adapt this model for games - which are experiences actively involving players in the story world - and you start to play music to them that treats them as a passive audience watching a film. You risk pushing them out of the experience when you could be offering them something more personal. So, in this sense, I strongly believe composing for games is about understanding the medium and not just being able to write music." What is the common process you go through when making a game's soundtrack? "It varies wildly by developer and publisher. Some adopt the film production model and have hard and fast release dates, whereas others take the view that a game is 'ready when its ready'. Basically, when getting on board a project you tend to see whatever materials exist at that point. You may get to see an early version of the game and there's usually a lot of concept art to see. Then you attempt to work out what the game needs, usually with the project's audio director, and you work through cues for the game and set dates for any recording necessary. "It's probably around then you will think about how to tailor content for any interactive music in the game as well. Nothing can kill musicality more than badly implemented interactive music, so it's best to try to formulate an approach as early as possible." Do you need to be able to read music in order to do the job? "It depends. If you're in the business of recording musicians and need to prepare scores for them, then it's very helpful. But if everything you are creating is coming out of a box, then I guess not. It's good to be able to do both, in my humble opinion, as being a composer these days is probably one of the most inclusive roles in music there is. Composers need to write music, be pretty decent sound designers and they often have to wear the producer or mixer's hat as well at times - they oversee pretty much every stage of music production." What gear and software do you use most in your work and why? "My workhorse sequencer has been Cubase ever since it came out, and it's the best sequencer as far as I'm concerned. A lot of my music - particularly orchestral music - gets mixed in Pro Tools, and I like to export most of my audio from Cubase before mixing. Then I tend to use Sony Vegas and Sound Forge for day to day tasks, working to video and editing - partly because of their portability. "I've had a lot of synths over the years, but in this era of plugins I find that the only ones I still use are the Waldorf Microwave, Kurzweil K2500 and Roland JD800. Soft synths I particularly like are Absynth, Zebra and the (now obsolete) Virus for TC Powercore. The hardware Virus still remains one of the best out there, in my opinion. "I used to use a lot of outboard gear, but, again, software has won me over in recent years. My favourite software reverbs would have to be Lexicon's PCM Native Reverb and Altiverb." Gear-wise, what are the essential tools for game music composers? "Firstly I would suggest investing in a decent monitoring environment - if you can't hear what you are trying to mix, you will have a problem"
"Firstly I would suggest investing in a decent monitoring environment, because if you can't hear what you are trying to mix, you will have a problem. "Secondly, if you plan on recording musicians, build a decent recording room and sound proof it as well as possible so you don't need to worry about getting a new take every time a bus passes your studio. "It also depends on your own approach to music and how you ultimately want to realise your music. For example, if you consider yourself a composer of purely orchestral music, you are going to need some good orchestral libraries to mock up your music until the stage you get to record the real thing." What are some of the common mistakes you see people make when trying to gain work in the industry? "When I worked at EA and we received demo tapes, I noticed that the ones that covered all the 'expected' styles like jazz, classical, techno music (and labelled as such) were the ones that generally least excited anyone. So, it's not really a pitfall, but I would suggest to young composers that they perhaps try to keep things personal and establish their own voice, if possible. "Another thing I'd suggest is not working for free as forever will it dominate your destiny, as Yoda might say. It's just not healthy, and it devalues what you do." What can budding composers and producers do to increase their chances of gaining employment in games music? "If you look at any industry's successful composers, you will see they forge strong relationships with specific studios or creative visionaries"
"Success seems to come to those who somehow manage to create the right music at the right time, heard in the right context, all within a commercially and/or critically successful piece of entertainment… A great deal is down to luck. But you obviously increase your chances by taking more chances and putting yourself out there. Working relationships are where it's at. If you look at any industry's successful composers, you will see they forge strong relationships with specific studios or creative visionaries, and their careers tend to blossom as a result of that." Finally, which of your projects are you most proud of and why? "When it comes to raw composition and recording orchestral music, I'd say I'm probably most proud of my music in the Harry Potter series, as the music was emotionally and stylistically wide ranging but I also got to record a first rate orchestra in London at Abbey Road Studios and Air-Lyndhurst, which is always a special experience. "But in terms of how well my music has worked in context, supporting the gamer's experience, I think the scores of two very hyped games of their time - Freelancer and Republic: The Revolution - work quite well, and successfully blurred the lines between sound and music. "Then there are themes, which are something I really love to get my teeth into given the opportunity. I'm fairly proud of Command and Conquer: Red Alert 3's Soviet March, To Save Humanity from Command and Conquer 4 and the Evil Genius theme I think is quite memorable as well." Game Music Connect is a one day show celebrating the art and craft of making music for games. This year's event takes place at on Wednesday 24 September at the Purcell Room, Southbank Centre, London.